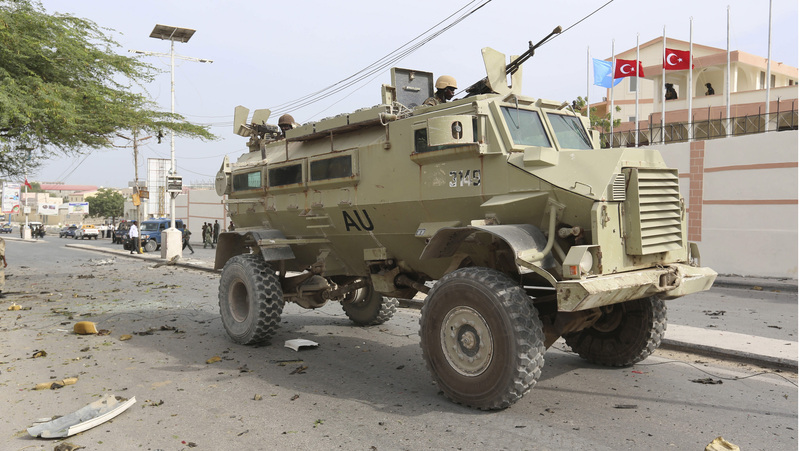 Picture: Somalian soldiers drive their armoured personnel carrier past the scene of a suicide car explosion in front of another hotel in Mogadishu last month. At least two people have been killed and Somalia’s deputy prime minister wounded, in an attack in a hotel in the centre of Mogadishu. Militants from the extremist group Al-Shabaab Islamist have claimed responsibility for the attack. Two explosions were heard on Friday at a hotel near Somalia’s presidential palace, and smoke could be seen rising from the building. Captain Mohamed Hussein, a senior Somali police officer said a car bomb was detonated at the gate of the Central hotel. Another suicide bomber then entered the hotel and detonated his explosives blowing himself up. Two bloodied bodies were lying outside the hotel in central Mogadishu, as soldiers cordoned off the area and fired bullets into the air to disperse approaching crowds. But it is feared death toll is far higher than the official count. Police major Nur Mohamed told Reuters that at least 10 people had been killed, including a lawmaker, security officers and civilians. “The death toll may rise,” he added. 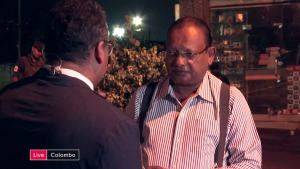 Deputy Prime Minister Mohamed Omar Arte was rushed to a hospital. He was among several other high-ranking government officials at the hotel at the time of the attack, Mr Hussein said. This is the second attack on a hotel in Mogadishu in less than a month. In January, three Somali nationals were killed when a suicide car bomber blew himself up at the gate of a hotel housing the advance party of the Turkish President Recep Tayyip Erdogan. Despite major setbacks in 2014, al-Shabaab continues to wage a deadly insurgency against Somalia’s government and remains a threat in Somalia and the East African region. The group has carried out many attacks in Somalia and in neighbouring countries, including Kenya, whose armies are part of the African Union troops bolstering Somalia’s weak UN-backed government. Al-Shabaab controlled much of Mogadishu during the years 2007 to 2011, but was pushed out of Somalia’s capital and other major cities by African Union forces. There are now fears that much of much of the violence is concentrated in rural regions.